A customer gave us a good question about Sushi/Sashimi knives. “Excuse my for a second mail . I forgot something. It can be a question by those who bought Japanese Style Aogami Super knives. The following was our answer, hoping it would be helpful for him. “Yanagiba are made mainly assuming that is used by professional chef who sharpen knives every day. Then the following disadvantages of “Aogami Super” will be noticeable. 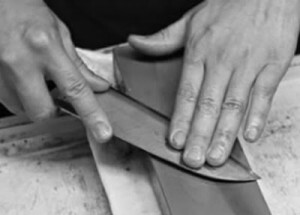 Advantages · · · Because the material is hard, sharpness lasts long, kitchen knife does not ware out. Aogami Super or Blue Paper Super Steel is a steel with 1.40% ~ 1.50% carbon inside. Though Chromium and Tungsten are the same amount as blue #1 steel, Molybdenum and Vanadium are contained in addition. Molybdenum has more sticky effect than Chromium. The stickiness is a factor to keep sharpness longer. Also, vanadium is excellent in friction resistance to produce hard steel material. The knives made of this steel should have feature to reduce the number of times to grind/sharpen, because it is very hard and sticky. Sharpness lasts for a long time! It looks very good because you do not need to sharpen your knife frequently and to replace it when become dull. The above-mentioned advantages may work in reverse, when you maintain the knife. If the cutting edge were chipped, you should have trouble sharpening it with your hands, you know. It must be a hard work for you to grind/sharpen it. If you purchase a knife after understanding this feature, it is OK. In fact, it’s no mistake that a blade of Aogami Super can cut very well. Please refer to the following article for more information.